The kind of distances and times just outlined suggest key issues are somewhat similar to those examined in Chapter 7; in other words, Isp (total mass of propellant to carry and accelerate), thrust (and the acceleration needed to reach final destination within reasonable time spans), and the power to sustain thrust. The only difference with the discussion in Chapter 7 is the extreme influence played by these three factors in planning QI and interstellar precursor missions. It is useful at this point to review the concept of Isp already defined in Chapter 7 for nuclear propulsion. Thrust is assumed here still based on Newton's Third Law, the result of change in the momentum of propellant(s). In the following, attention will be focused on QI missions where humans may play a significant role, leaving aside unconventional and intriguing propulsion means such as solar and magnetic sails, laser propulsion, and other technologies that still appear ''exotic'' to most rocket engineers and that are very often best suited to robotic missions, where payload weight or cost are severely constrained. 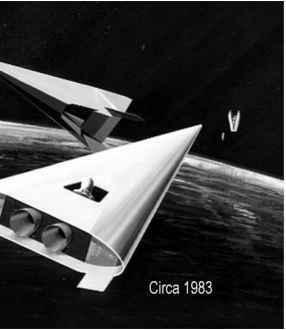 A recent discussion of these future propulsion technologies can be found, for instance, in [Bruno and Accettura, 2008]. In reviewing that concept, in fact, it is convenient to realize that thrust is the result of an energy conversion process going through three stages. In stage one, energy is stored as potential energy, for instance chemical, or associated to rest mass as mc2, according to relativity theory. When released, potential energy becomes the microscopic kinetic energy of particles already existing, such as unburnt fuel or inert propellant, or newly created, such as translational, rotational and vibrational energy of molecules, translational energy of neutrons, alpha and beta particles, and energy of photons, hv: this constitutes the second stage. In the first class of nuclear engines described in Chapter 7, it is the confinement effect of a nozzle, conventional or magnetic, that converts this "microscopic" kinetic energy into the macroscopic, ordered motion of particles, that is, kinetic energy 0.5 mV2 of the exhaust jet (stage three). It is this third and last stage that is responsible for bulk flow momentum change, and therefore for the rocket thrust. The ideal specific impulse is nothing else than the exhaust velocity, Ve. If energy is conserved, the kinetic energy of stage two and three must be equal. So, the exhaust velocity, or Isp, ideally attainable must be equal to that of the microscopic, energetic particles inside the chamber where potential energy is released and where the macroscopic (bulk) flow speed is essentially zero (stagnation). In a chemical rocket the ideal Ve will be exactly equal to the mean molecular speed at the stagnation chamber temperature. In a propulsion device based on other forms of energy conversion, equating stage two and three, and neglecting relativistic effects, shows immediately that the Isp can be defined as the square root of twice the microscopic kinetic energy per unit mass, J, of the medium utilized as recipient of that energy. In fission propulsion the medium could be the very fission fragments mentioned in Chapter 7, possessing kinetic energy of order 167 MeV [Hill and Peterson, 1970, p. 475] when fissioning 238U fuel. In hydrogen fusion, the energetic particles are He nuclei, possessing lower average energy, say, between 4 and 40 MeV (see Figure 8.3). However, fused He particles are much lighter than average fission fragments, so their specific energy, or energy density, J, is larger. This way of writing Isp shows immediately the gain in performance going from chemical (J - 107 J/kg) to fusion (J — 1014 J/kg) propulsion (see Figure 8.3). 2,500 to 3,000 K at most, and the Isp will be no different from that of a NTR. The gas-core and the Rubbia's concepts in Sections 7.14 and 7.15 circumvent somewhat the limitation imposed by the melting point of structural materials, raising Isp by a factor 2 to 3 with respect to NTR. The same strategy might be possible, perhaps, also in fusion rockets, but the actual propulsion gain with respect to fission rockets of similar type will be questionable, limited only to lower fuel consumption. Unless thrust is based on acceleration of the fusion fragments, higher Isp may become feasible only with fusion-powered NEP systems, that suffer from low thermal and electric efficiencies and weight penalties. So, generally speaking, the advantage in energy density of fusion over fission is not so extraordinary to enable a "jump" in performance over that of fission-powered rocket systems. The ideal Isp attainable by fusion may be, however, extremely high if fused particles are themselves the "propellant" and are ejected with all their microscopic kinetic energy. In this case there is indeed a significant difference between fission and fusion rockets. Fission fragments from 235U are "heavy", falling into two main ranges centered roughly at about 40 and about 160 atomic mass units. Fusion fragments instead consist mainly of 4He, a nucleus a factor 10 or 40 lighter. Everything else being equal, the Isp potentially available with fusion rockets will be accordingly higher than fission by the square root of the same factor, also because the specific energy of fusion products is about five times higher than in fission. 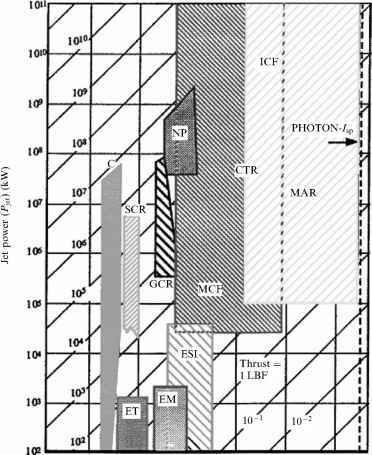 T. Kammash estimated ideal Isp with different fusion rocket concepts, as given in Figure 8.4 [Kammash, 1995], which shows that the Isp of a magnetic confinement fusion (MCF) rocket may be 102 to 103 times higher than fission propulsion concepts. Similar data are in [Lawrence, 2005]. Even higher Isp is predicted for a mass annihilation rocket (MAR), that may be defined, with some reason, as the extreme form of fusion in which all mass is converted into energy (a = 1) [Morgan, 1982; Forward, 1985]. The last vertical line on the right of Figure 8.4 is the theoretical Isp of the Saenger/Rubbia photonic rocket concept of Chapter 7. Its Isp is exactly equal to c, if consumption of nuclear fuel is not accounted for in the mass consumption rate. If the energy of fused particles at stage two is thermalized in a much larger mass flow of a secondary (inert) propellant, J decreases and so will temperature, a good thing for the engine structure. Isp will decrease as well, depending on thermalization strategy, but less so than J, because of the square-root relationship, just as shown for fission propulsion systems in Chapter 7. For instance, the J available at stage two could heat a secondary propellant expanding in a conventional nozzle, resulting in Isp of the same order of solid-core nuclear thermal rockets (about 1,000 s). Alternatively, high J fusion products could heat a working fluid and generate electricity via conventional thermodynamic cycles, just as in nuclear electric propulsion. The electricity can then power an electric thruster, for instance a large MPD rocket: thus Isp could be made very high, but efficiency of the thermodynamic cycle and of the thruster would be low, perhaps of order 30%.